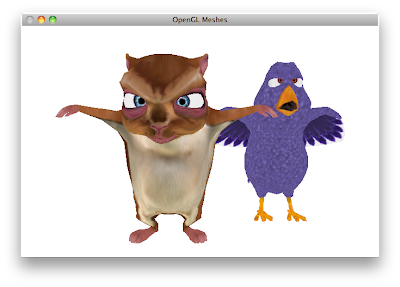 As you can see from the bigger Screenshot below, Today is time to put some characters on the OpenGL stage. And the two guys below are two of the characters of Yo Frankie! (http://www.yofrankie.org/). Following the preview post I've extended my GLData Library adding support for Textures and using another source format as Input File, I've also made a simple Blender-Export Script that allows you to easily export blender meshes with textures, vertexes and faces. If you are, as me, fan of black and white command lines, The result is stunning. And there're just few lines of code. The code can be downloaded from here: GLData Blender Source Code. It contains the source code, textures, meshes and the Blender Export Script.